Sales leaders who recognize and reward sales achievement do more than boost morale; they achieve growth and positive ROI. Terryberry can help you design and implement a sales awards and recognition program that will energize your people with big results for your business. Sales can be a grueling field, with employees nurturing relationships for days, weeks or even years before successfully making a sale for your company. Salespeople speak daily with many others who are at best not interested and at worst may be inconsiderate. But the tough parts of the job are what make the successes so worthwhile, and there’s nothing like the feeling of winning over a difficult prospect or finally meeting a sales quota. Making sure your sales staff knows that you see the extraordinary efforts they put into driving business for your company goes a long way toward motivating them to continue doing a great job. Find sales incentive ideas from Terryberry to make a positive impact on your sales team. 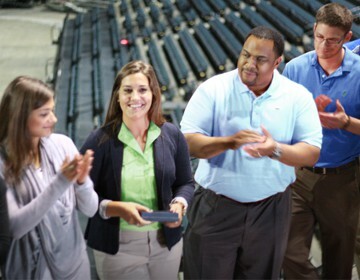 Terryberry offers recognition solutions for sales departments of any size. With the experience and resources to help you at any stage, we can assist with program design and goal-setting, award selection, promotion, and fulfillment. We’ll help you recognize your top performers and “motivate the middle” to achieve higher levels of success. A well-designed sales award program with a selection of prized awards will fuel your sales team’s drive to win. Terryberry specializes in custom awards for maximum motivation and trophy value. Since Terryberry has no minimum orders, we can help you with one special employee performance award, or we can help you implement a complete sales recognition program for ongoing sales motivation and recognition. 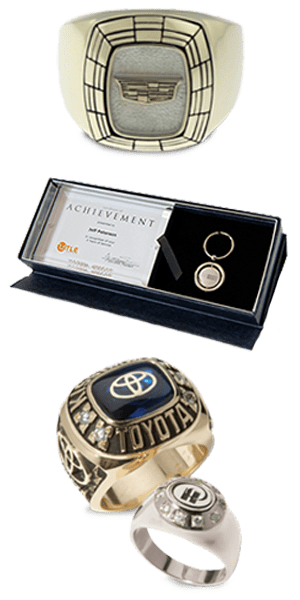 Custom award rings are a unique sales incentive that tastefully showcases your logo and can be personalized for the recipient. Reward varying achievement levels with AwardChoice tiered awards. Recipients select a reward of their choice from a variety of items at the price point you specify. Print catalogs and online selection are available, and we handle all of the administration for you. Brand name lifestyle gifts like fishing gear, gourmet cooking tools, or photography equipment can be customized with your corporate logo. Engraved awards offer a permanent display to commemorate a sales achievement. Terryberry’s AwardPoints program is an effective solution to manage your sales award program. Salespeople accumulate points as they progress toward goals. Ongoing feedback fuels your salespeople to achieve greater success. Your program dashboard provides detailed reports. 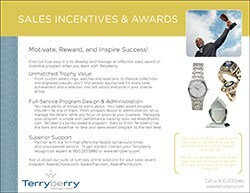 No matter what your sales goal or sales award idea, Terryberry’s award consultants can help you implement a sales recognition program that will get maximum results. Contact us to discuss your needs or to get ideas.